Both Phones comes with Metal body, a fingerprint scanner on the front.Both have 5.5-inch (1080 x 1920 pixels) Full HD 2.5D curved glass display.Oppo F3 is powered by 1.5 GHz Octa-Core MediaTek MT6750T 64-bit processor whereas Gionee A1 comes with a 1.8 GHz Octa-core MediaTek Helio P10 processor. Both has 4GB RAM and 64GB of internal storage further expandable with MicroSD card also 13MP rear camera. On front, Opo F3 has a Dual 16MP front-facing camera with 76.4-degree wide-angle lens, 1/3.1-inch sensor, f/2.0 aperture+ 8MP front camera with 120-egree wide-angle lens whereas Gionee A1 has a 16MP front-facing camera, f/2.0 aperture, selfie flash. Oppo F3 runs on Android 6.0.1 (Marshmallow) with ColorOS 3.0 whereas Gionee A1 comes with Android 7.0 (Nougat) with Amigo 4.0 UI.Gionee A1 has 4010mAh battery with fast charging whereas Oppo F3 comes with 3200mAh Battery. OPPO F3 comes in Gold and Rose Gold colors and is priced at Rs. 19,990. It is available for pre-order exclusively from Flipkart as well as offline stores from today till May 12 and goes on sale from May 13th.Gionee A1 comes in Gray, Black and Gold color priced at Rs 19,999. 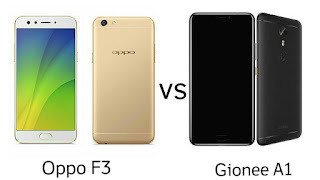 Oppo F3 has Dual Front camera, the processor is that powerful also runs on Marshmallow compared to Gionee A1 which has Android Nougat,4000mAh battery.at this price point, there are other options like Moto G5 Plus, Lenovo P2, Xiaomi Redmi Note 4.